This Q&A is from the 2018 launch of the Mercedes-AMG Petronas Motorsport team. Question: Lewis, today you’ll get to take the new F1 W09 EQ Power+ on the track. Last week you visited Brackley. How did it feel to be back? Lewis Hamilton: It felt great to be back. It’s always such a great working environment in the factory. The first time back in the year is always exciting because there’s great anticipation of the car being built. It’s very humbling to see everything coming together. People have worked so hard on this car, committed for such a long period of time. I’m just keen to get out there and take it to its limits. I’m one of only two people who get to drive it and there’s this proud feeling because I know how much work has gone into getting the car ready. 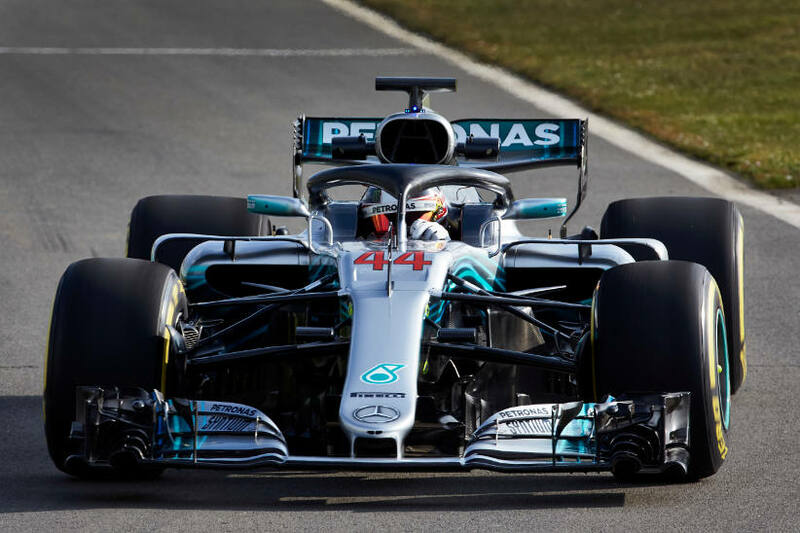 Question: The new car is more than a machine – it’s the most advanced Mercedes F1 car ever built, but it also represents more than a thousand years’ worth of working hours as well as the team’s hopes and dreams. Does that put extra pressure on you? Lewis Hamilton: To be honest, the pressure I put on myself has always been the most. But there’s added pressure. You’re nervous about damaging the car that all these people have worked so hard on – but I know that they don’t think about that. They know that I am going to give it everything and that’s what they want to see. I know what potential I have in me and I just want to make sure I utilise that and bring the out the maximum of potential of the great machine the team has built. Question: 2018 will be your sixth season with Mercedes-AMG Petronas Motorsport, your record with the team is impressive. How do you feel when you look back on the time with the team so far? Lewis Hamilton: It’s hard to believe that it’s already our sixth year together. It feels like it’s gone by so quick. I remember my first time coming to the factory in Brackley, doing my first seat fit and it’s just strange to think that now we’re here as far down the line. It has just been a dream experience – working with the greatest team and extending my relationship with Mercedes who I signed with when I was 13. It’s been an emotional rollercoaster together. Question: How do think the team has developed over the past five years? Lewis Hamilton: Already when I first came it felt like a real racing team – with the factory and the way it is set up. But the team has come such a long way since then. Having Toto at the forefront of it, seeing his vision come together, it’s really quite remarkable how the factory and the energy in the buildings has shifted. The working environment is just phenomenal, it has improved so much and to see that reflected in the work that people are doing is incredibly impressive and inspiring. It’s been amazing to see. Question: Looking into the future – where does the team need to develop? Lewis Hamilton: Mercedes already is the best team and it continues to grow into a stronger team. The foundation is very strong and now they’re putting the right building bricks in place. I think the team is going to continue to grow and I hope that I can be a part of that for as long as I can. Question: Who do you think will be our main competitors this year? Question: We see a few changes for the new season – less power unit components, the halo, new tyre compounds. What do you make of that? Lewis Hamilton: It’s getting harder and harder for the team in Brixworth and the people in Brackley, but they’re continuously rising to the challenge which is great to see. I think it will be tough for everyone this year with the regulation changes. It puts more emphasis on me, making sure that I’m very careful with the engine. We just need to make sure that we maximise it as much as possible. Reliability will continue to be a key player in the sport as it has been in previous years. But I know that I’ve got the best team working as hard as they can to make sure that we’re at the forefront of that. Question: With the introduction of the halo the minimum weight of the car increased by 5 kilograms to 733 kilograms. What impact does that have from a driver’s perspective? Lewis Hamilton: The car is getting pretty heavy year on year and that does affect the car when you’re driving it. Adding weight just slows the car down, but it gets faster with development again. I think at the moment seeing the halo on the car is quite alien to us, but I’m sure we will get used to it and it will become the norm before we know it. Question: In 2018, we will go back to Hockenheim in Germany and also race at Paul Ricard in France. What are your thoughts about that? Lewis Hamilton: I remember my first time to Hockenheim. I think I was 13, I went along with Nico. I was sitting with Ron and he was asking us if we could cope with being in the same team as kids. That was at the old Hockenheim circuit which was one of my favourites back then. But the track is still great as it is now. It’s quite small but it has that big long straight in the back which creates good racing. I’m excited to be going back, Germany has such a great fan base for motor racing. It’s important that we go to countries where there is a long lifeblood of fans because this sport would be nothing without its fans. We are going to new countries and new territories which currently might not have a real fan base and the goal is always to encourage new people to join. But we can’t ignore the true fans that are at the heart and core of this sport. So I’m really glad that we’re going back to both Germany and France. Question: Last question: What are you most excited about in 2018? Lewis Hamilton: I’m just looking forward to racing again. It’s crazy – I’ve been racing forever, but it’s still freaking good. I still get the buzz. So I’m just excited to get back into it. I could pretty much race every day.